I awoke with a craving for something bready and salty and nutty. But it was 3.30 am. What’s going on? The mind! Heat and cold, happiness and distress, hunger and satiation – these are all dualities of life. I remembered the famous phrase from Bhagavad-gita (you know the one – where Krishna recommends that we try to be equipoised in the face of happiness and distress). Sukha means happiness in Sankrit. And Dukha means distress. Two sides of the same coin. I looked up the verse to remind myself of the exact wording, and voila! This olde blogge came to mind. Why is that, I wonder? My reply: Hello Stephanie! Yes that sounds like the Egyptian spice, seed and nut blend called Dukkah. I have a recipe for it in my latest cookbook. Here it is. You might like to duplicate it at home. Very tasty and nutritious. Dukkah is a loose, coarsely-ground mixture of sesame seeds, hazelnuts and aromatic cumin and coriander. It is delicious eaten on oil-dunked bread for breakfast, or as a snack. It has of late started appearing quite regularly on Western restaurant menus as an appetizer. Variants of dukkah are found all over the Middle East, and this version is from Egypt. It is a very personal and individual mixture that varies from one family to another; hence no two versions are exactly the same. The important thing to remember about dukkah is that it should be dry and crumbly. It is easy to over-grind the ingredients, especially the nuts, which makes the mixture too oily. To prevent this, cool the ingredients after roasting, then proceed slowly. Makes about 2½ cups. 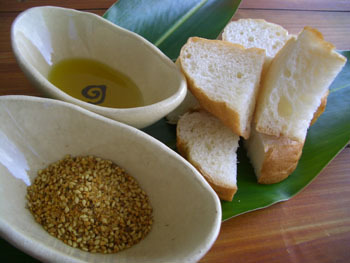 olive oil and crusty bread for serving. Roast the hazelnuts on an oven tray for about 15 minutes, or until fragrant. Remove them from the oven, and when a little cool, rub away as much of the brown skin from the nuts as you can. Toast the sesame seeds in a heavy frying pan over moderate heat, stirring often, for about 4 minutes, or until golden brown and aromatic. Empty the toasted seeds into a bowl. Toast the coriander seeds in a similar manner for about 2-3 minutes. Repeat for the cumin, toasting for about 2 minutes. Pound the seeds and nuts using a mortar and pestle, or whiz them in a spice or coffee grinder. The mixture should be dry and crumbly, not oily. Combine the crushed nuts and seeds with the salt and pepper. Serve as a dip with olive oil and crusty bread. Note: The mixture will keep in a sealed container for many weeks.